Aloft in Aerocity is a month-old business hotel that doesn’t believe in playing by the rules. 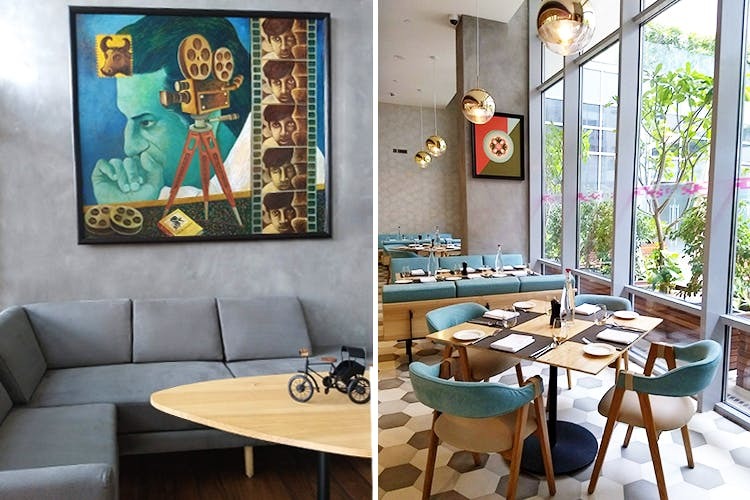 They’ve got funky artwork in every corner, a farm-to-table restaurant, an infinity pool and a cute lil’ bar that’s currently stirring up spicy cocktails (Jalapeno Mojito or a Jamun Margarita, anyone?). We’ve seen a couple of business hotels through the course of our caree,r but none as outgoing and chill as Aloft. Why? Well, hear us out. Soon as you set foot inside what looks like a typical 'hotel', you’re struck by how airy and sunlit everything is. Big French windows and artworks (hey, you gramophone, vintage radio and old Bollywood posters) sourced from all over, lend it a very young-person character. The art gallery inside the hotel that stocks up on antiques and retro finds, is in fact our favourite corner. So if you’re keen on knowing the stories behind every painting that hangs or sits on Aloft’s walls, sign up for the gallery’s curated tours. In keeping with their philosophy of going local, they intend to host live gigs in the lobby every weekend (if you play the saxophone or an acoustic guitar, hit them up). This approach extends to the restaurant that sources veggie produce from a nearby farm and serves meals that are all things seasonal and fresh. We have a soft corner for the chef’s special plates of progressive Indian cuisine, and bar snacks that go perfectly with fresh fruit cocktails (dahi kebabs and tikkas included). After a hearty meal, you’ll love your room a bit more too. It’s one of the only hotels where the rooms are big, affordable (they start at INR 5k a night) and full of natural light. And, when you get tired of those fluffy pillows or street views from the room, their coffee shop and co-working space will welcome you with both arms. Aloft’s rooms with connecting doors are tailor-made for big family get-togethers and them Delhi party scenes. Don’t forget to save some time to chill by their pool bar, floating into infinity on the hotel’s third floor. Guilty of day drinking? Oh, their fitness centre (with a Korean spa coming soon) is spectacular.